So Shriekback have a petition up to gauge interest in a CD re-issue of “Jamscience” paired with the elusive Hatfield Poly ’85 show they self-issued on CD-R a dozen years ago. Getting those on legit, pressed CD will go a long way for assuaging my Shriek-angst at only having the former on vinyl. But the wheels don’t stop turning in Shriek-land when the sun goes down. In fact, they only speed up. The band are now hinting that other examples of their early form may also be ripe for the plucking to re-issue them as another twofer CD. This time, the scarce-as-hen’s-teeth-on-CD album “Care” is the big fat bait. Like many, I immediately bought the US pressing of “Care” after hearing the 12″ of “Lined Up,” courtesy of chasinvictoria many years ago. But the US pressing substituted the track “In:Amongst” for “My Spine Is The Bassline,” a stellar non-LP single. But to date, the “Care” album was released on CD only once, 21 years ago in… Australia. Needless to say, not too many copies filtered their way into the Northern Hemisphere. I only ever found out about this in 1998 when visiting JT and he played me the rare cut “In:Amongst.” If Shriekback make good on their intentions, we can all finally hear this cut, alien to our fair country, but included on the worldwide pressings of “Care.” But they have also posited pairing this with more goodies for a 2xCD twofer. Now, how much would you pay? 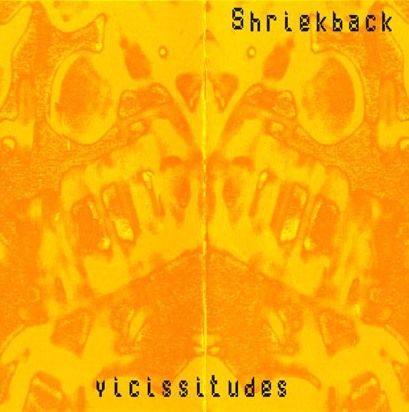 I was lucky enough to have spotted this, the last Shriekback release I’ve bought, in the Washington D.C. Tower in 2002, and good thing, too, as it was the twofer bundled with the album “Naked Apes + Pond Life.” I can vouch for the caliber of these early rarities as any Shriek-fan would enjoy the selection. The Shrieks have proposed bundling these tracks [less the live “White Out,” which dates from the hatfield Poly ’85 show and will be released on the set discussed yesterday] with “Care” and also including another disc of rarities that I do not have as further Shriek-geek-bait. This was not on my radar in 2002, so a reissue of these rarities, seemingly comparable to those on “Aberations 81-4” would be highly welcome to me. “Care” is a succinct album, so it may be that one could fit all of the tracks on “Care,” “Aberrations 81-4,” and “Vicissitudes” on a pair of CDs, less the live tracks from the Hatfield Poly show. I hope that I can find out in the near future! I can see projects like this being ultimately crowdsourced if the band get good feedback for, er, putting out feelers. This entry was posted in Core Collection, Want List and tagged 1983, 2001, 2002, CD reissue, Shriekback, Want List. Bookmark the permalink. I’d buy both. 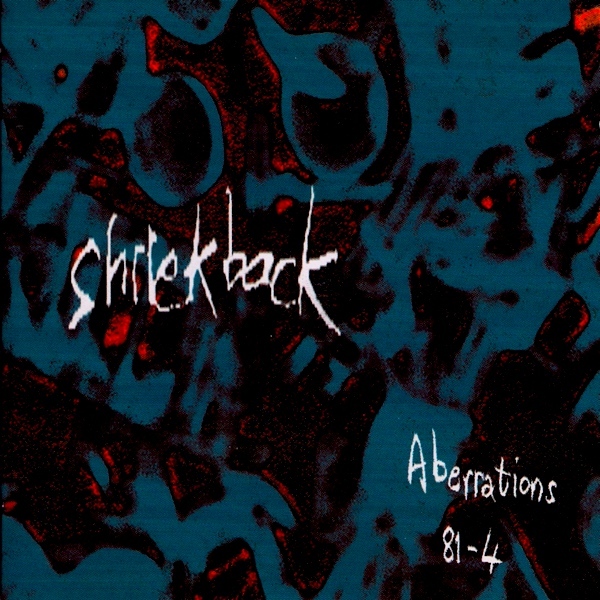 The unavailability of early Shriekback on CD has always been disappointing to me. Jon Johnson – Welcome to the comments, I concur! What I would not give for “Tench +,” “Care +,” and “Jamscience +” *with all of the attendant remixes and B-sides! Why stop there? The first five albums are all worthy of wringing every last drop from them with DLX RMs. Three of those titles could easily be 2xCDs. At least the band are proposing something! All the early work proves to me, beyond any shadow of doubt that Dave Allen has been one of the greatest bass players I have ever heard. People tend to discount the original lineup of Shriekback was a sort of Post Punk supergroup without really trying to be. Andrews is certainly responsible for some of the most quirky sounds of XTC’s first two albums, lent his abilities to Robert Fripp’s League Of Gentlemen and worked alongside Bowie and Pistol’s Glen Matlock on Iggy Pop’s Soldier album. 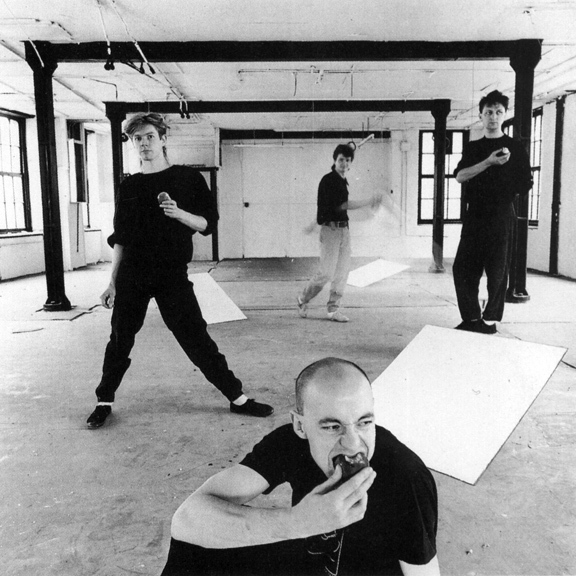 Allen is half of one of the most angular and ferocious Post Punk rhythm sections with his work as bassist while a member of Gang Of Four on their first two albums. 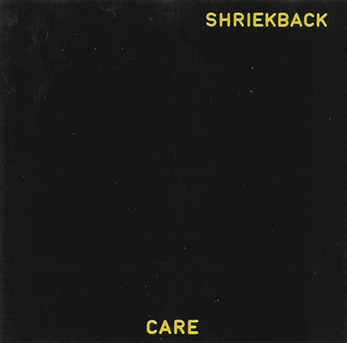 This was what led me to seek out Shriekback initially, but when I hear Lined Up for the first time, I knew that what they were producing was much more than the sum of those individual parts. I count Oil + Gold as one of my favorite albums of all time. It is at times mysterious, darkly ominous, politically charged and barrier breaking. There are elements of Funk, Ambient, and Post Punk swirled together into a thick shimmering sound. I would even go as far as to posit that Shriekback’s sound on Oil + Gold is owed more than a debt of gratitude from Underworld Mk ll, which was massively successful using their blueprint. Monk, I’ll just reiterate what I said to you in person last month: all of the Shriek records post-“Sacred City” are worth a spin, they all have some gems on them, and they all have some good ideas. However, they all also all sound a little unfinished to me; none give quite the satisfaction of “Oil and Gold”, “Care”, or “Big Night Music” (my three Shriek faves). The ideas on all of the post-“Sacred City” records could have been taken further, the songwriting could have used a few more musical ideas per song, the engineering and production could be a notch more polished (not “Go Bang!”-style overpolished, but at least brought up to the level of “Big Night Music” or even the indie “Sacred City”), and the performances could have used a bit more mojo. All good listening for Shriekback fans records, but none are *great* records. Also, the Aussie “Care” CD is encompassed entirely (with most of the requisite extra tracks, including the “Tench” EP – which the Shrieks consider their first album) on the 2CD “Y Records Years”. I made a tidy profit selling my Aussie “Care” on Ebay after the Y compilation came out. I sent you a quick rip of the tracks I could track down a few years ago (you’d call it a “re-master” in record cell lingo), but you’d want to listen to the Y comp on CD, both of the “best ofs” (with the lizards on the covers), and the vinyl 7″/12″ for “Lined Up”, “My Spine”, and “Accretions”. Bass line has no point of view. the Jam Science cds have just gone up on Shriekback.com – i’ve bought mine!! Nick – I got mine yesterday! Nick – Clarity… I ordered mine yesterday. I have yet to receive it. 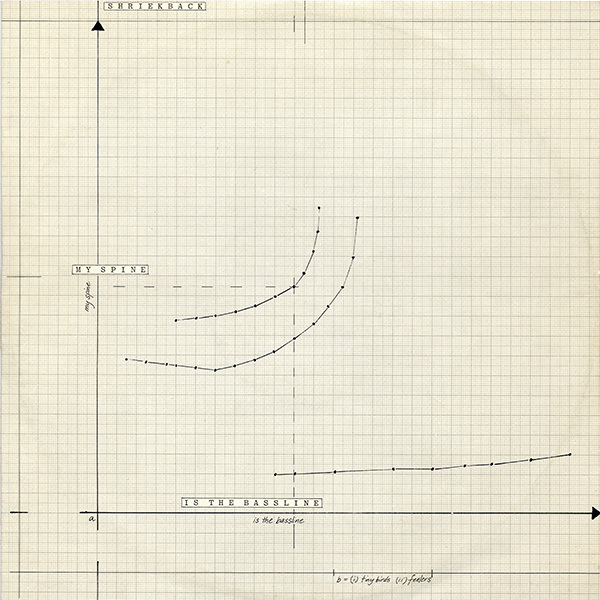 Mastering from vinyl is fine for me in this fallen world of missing master tapes. I just want a good job done. Their efforts save me 20-60 precious hours of work. Hopefully, they do a better job than I can with the modest tools [but Monastic fanaticism] available to me. Where it becomes crucial for me is whether the resulting disc is pressed, or burnt. Pressed CDs are the thing! They will last the rest of my life. CDRs have a finite life lasting mere months to a decade or so. Gold media is the closest thing we have to archival burns [I use it for my projects] but even those are thermally vulnerable. Hot cars and CDRs are a bad, bad combo! Can you verify if the CD was pressed? Nick – Yesssss! You’ve made my day, sir! Thanks for the verification. I agree that it’s a fine thing at a modest price. What more can we hope for but that the Shrieks continue to work that legacy action while simultaneously moving forward.